HUGS 2011 is Rolling out the Red Carpet. Ready to See & Be Seen? The countdown is on for the HubSpot User Group Summit (HUGS) in Boston, September 15-16, with just one week to go. HUGS is a global gathering of inbound marketers that promises to help you master the art of inbound marketing with keynote speakers and two full days of content sessions. At LyntonWeb, we are looking forward to this annual meeting of brilliant marketing minds! HUGS is a mecca for knowledge-transfer among successful marketers, making it the “hub” for both HubSpot users and prospective customers. This year’s event offers over 20 information-packed sessions about what’s on deck in the world of inbound marketing - from social media, to mobile marketing and social CRM. Not-to-miss moments of this year’s HUGS agenda include a top line-up of distinguished speakers - Youngme Moon, Guy Kawasaki, Dan Heath and Brian Halligan. Dan Heath: Co-author of best-selling book, Made to Stick: Why Some Ideas Survive and Others Die, Consultant to organizations such as Microsoft, Nestle, Nissan, and Macy's. HUGS 2011 content and activities are tailored for customers, prospective customers and HubSpot Value Added Resellers (VARs). This year, organizers added new types of sessions and tracks based on feedback and preferences from last year’s attendees. To accommodate the varying degrees of inbound marketing proficiency, “tracks” have been established. You first determine whether Beginner, Intermediate or Advanced seems to best fit your current stage of inbound marketing expertise. This is mainly used to help understand the current demand for content. So, if you later notice that you aren't in the right track, you are welcome to change up which sessions you attend. View the official 2011 HUGS Agenda. 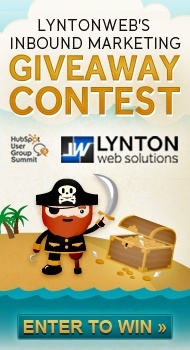 In celebration of the second annual HubSpot User Group Summit (HUGS), LyntonWeb is giving away a boatload of free services to help businesses navigate the high seas of inbound marketing. Don’t miss your chance to win a valuable inbound marketing package! We'll help you develop a strategy for your web content and blog. We'll write four blog posts, an online press release, and provide a content calendar to keep you on track for continued success. Your company's blog serves as the best potential for new traffic and leads. We'll help you develop a conversion strategy for the blog to make sure those readers are converting into subscribers, leads and customers. We'll design a custom blog template to help position your brand as a thought leader. Lastly, we'll create a custom Call-to-Action (CTA) button generator, so you have an easy way to add CTAs at the end of every blog post. Do you have compelling content and offers to give away on your landing pages? Great! How are you doing converting those landing page visitors to leads? Not so great? We can help with that. After a brainstorm and consultation session, we'll design a landing page template that grabs visitors' attention and drives them to convert. We'll also design a cover page template you can use for your ebooks. Generating leads couldn't be easier! LyntonWeb's CRM Connectors enable instant lead flow between HubSpot and your CRM. This is simply a must for any business running HubSpot Medium or Large edition. Supported CRMs include Microsoft Dynamics CRM, NetSuite, Infusionsoft, and Sugar Professional. LyntonWeb has been an enthusiastic partner of HubSpot's since 2009. We will be at HUGS representing Houston-area web design and inbound marketing. We hope to see you there! If you need a little more incentive, read the Top 6 reasons why you should attend HUGS 2011. Don’t forget to enter our Inbound Marketing Giveaway Contest. LyntonWeb will be announcing the winners on September 30, 2011. Good luck!